At Linkam we are passionate about design and manufacture of stages, electronics and software that can be used with microscopes, spectrometers and diffractometers to enable scientists to analyze and characterize samples. That describes Linkam in a nutshell, but there’s so much more to us than that. 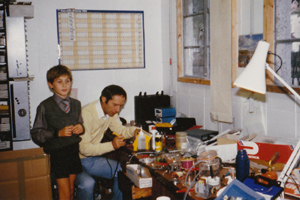 Linkam Scientific Instruments was officially incorporated in October 1982 by Arnold and Louise Kamp, a Dutch couple who arrived in London in the late 1960s attracted by England’s wealth of post-war opportunity. The company name comes from a combination of their family names, Van der Linden and Kamp. After a few years at Honeywell working on petrochemical instrumentation, Arnold had joined the R&D department of Stanton Redcroft, where his flair for technical design flourished. Stanton Redcroft was the only UK manufacturer of thermal analysis equipment at that time and after a short while Arnold was appointed head of research and development. His designs of thermobalances, differential thermal analyzers and differential scanning calorimeters earned him a variety of design patents, many of which were used by high profile manufacturers of thermal analysis equipment. Some of these early designs are still used today. The confines of the corporate structure did not suit Arnold. He had ideas of his own and aspirations to set up his own business, as both his father and grandfather had done. In his spare time he started designing and machining small temperature-controlled stages for microscopy. He invested in a small lathe and mill and spent many hours in his garden shed building the early Linkam stages. In the early 80s inflation was at 12% and the land where Stanton Redcroft was based became more valuable than the company and so it was stripped of assets and dissolved. Arnold decided to take his part time enterprise full time, a frightening prospect with a young family to support. Arnold Kamp was now officially Managing Director and his wife, Louise Kamp, was Financial Director and Company Secretary. Work continued in the garden shed/machine shop and converted garage at the side of the house. Arnold designed and built equipment, Louise managed the orders and kept the books in order, while the kids, Vincent and Jacqueline, cleaned the machines. Before long the fledgling company had to take on more staff to help with the electronics and assembly work. Peter Grocutt, a young electronics whizz straight out of college, joined the team enabling the electronics to take a leap forward. Word of the outstanding build quality and performance of these Linkam hot stages quickly spread within the geology and liquid crystal scientific communities. Demand for Linkam stages was growing each month. In 1987 Linkam bought Unit 8 Epsom Downs Metro Centre in Tadworth, Surrey. The building was needed to house more staff and more machines. CNC was relatively new technology at the time but Arnold and Peter modified the Mill to develop CNC capability in order to cut down on production time. Meanwhile Arnold and Louise were flying around the world establishing new distributors and exhibiting at trade shows and conferences. Arnold was once told that if you can sell in Japan then you can sell anywhere. Rising to the challenge he visited Japan and convinced an enterprising young Japanese entrepreneur, Takamasa Iwasaru, to set up his own trading company in Kyoto. Ever since, Japan High Tech Co. Ltd has exclusively represented Linkam in the Japanese market and remains Linkam’s best distributor. 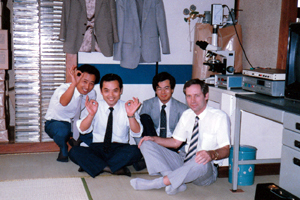 By the late 1980s Linkam was a well established company and was developing many new applications for instruments, notably in the field of cryobiology where accurate low temperature work, free of condensation, had not previously been possible. In 1994, now bursting at the seams with potential, Linkam bought the neighbouring Unit 9 on the Epsom Downs industrial estate to re-house the machine shop and production line. Linkam then started to diversify from heating and cooling, utilising its design expertise to develop more capabilities for sample characterization. Optical rheology was an active new field of research. 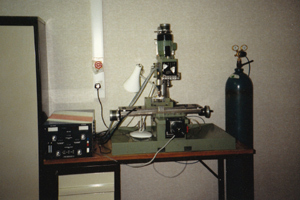 A collaboration with Prof. Malcolm Mackely at Cambridge University led to the development of the Cambridge Shearing System (CSS450) which enabled rheologists to apply shear stress to their samples and view the changing morphology on a microscope. Linkam has always worked closely with scientists to develop custom solutions to enable the advance of scientific research. Profit margin has rarely if ever been a deciding factor in taking on a project – if the work seemed interesting enough Linkam would take it on. Driven by Arnold’s enthusiasm for design and his tenacious problem-solving skills, Linkam became a unique “go to” company for building one-off temperature controlled instruments. Many larger instrument companies constrained by accountants and bureaucracy used Linkam to develop instruments for them. Business continued to grow and now it was Vincent’s turn to travel the world promoting Linkam’s hot stages and setting up distributors. Linkam has always recognized that instrument R&D is its strength. Developing custom solutions and then spinning them off into standard systems had become a very successful business model and so it was decided to invest further in R&D. At that time there were more opportunities in Holland than in UK to find experienced R&D staff and reasonably priced industrial units. In 2002 a new division of the company, Linkam Holland, was set up. State of the art CNC with CAD/CAM technology was installed in Holland to enable the engineers under Arnold’s direction to develop completely new, blue sky, instruments independently of the production facility in the UK. This new division quickly became an excellent source of innovative new instruments. In 2004 Linkam suffered a huge setback when Louise Kamp passed away after a yearlong battle with cancer. Louise was the lifeblood of Linkam, respected and maybe a little feared, but nevertheless loved by all the staff. Her flamboyant enthusiasm was infectious and vital to the success of the company in the early years. It was now up to Vince to step in and fill the huge void left by Louise. Louise. M. Kamp-Van der Linden, Founder, Financial Director and an inspiration. Life at Linkam was a little rocky for a couple of years, but then business started to grow again. It was time to invest further in the UK. The R&D facility in Holland had become well established as a hotbed of creative talent that was developing innovative ‘one off’ prototypes for customers, but Linkam needed a state-of-the-art R&D department in the UK to service a steadily increasing demand for custom solutions. In 2007 Linkam purchased, gutted and refurbished Unit 10, near to the firm’s facilities in Units 8 and 9 of the Epsom Downs Metro Centre in Surrey, to house the new R&D department. The UK R&D department now occupies the entire top floor of Unit 10 and has the latest 3D design software to create prototypes on screen before a single cut is made by machine. Although 3D software has facilitated the design process, Linkam has high precision CNC machines which are used for rapid production of micron-accurate parts for prototypes. 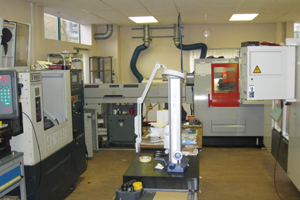 Other CNC machines are then used to manufacture the aerospace-grade parts for the standard hot stages. The latest challenge for Linkam is working within the wide variety of new legislation affecting manufacturing. We have been labouring around the clock to satisfy the various certificates of conformity that many manufacturers seem to have ignored. CSA, UL, CE, ROHS, WEEE – you name it, we at Linkam are working to conform to it. At Linkam we continue to innovate and develop new products, working closely with scientists in countries round the world to create novel solutions that help advance scientific discovery. Linkam is still fully owned and run by the Kamp family. That enables us to make decisions quickly and adapt to a continually changing market. At Linkam we are passionate about what we do, and we believe this is shown by the quality of our instruments and our dedication to improvement and innovation.